BARCELONA, Spain and STUTTGART, Germany, May 21, 2006 -- This afternoon the Spanish King Juan Carlos I started his special Maybach experience in the setting of the Laureus World Sports Award in Barcelona. The keys for the "Cote d'Azur" blue luxury Saloon were handed over by Dr Dieter Zetsche, the Chairman of the Board of Management of DaimlerChrysler AG and Head of the Mercedes Car Group, at the Catalonian Grand Prix racetrack "Circuit de Catalunya". 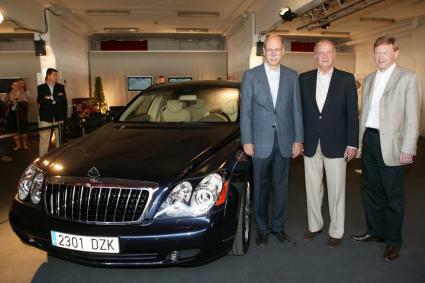 King Juan Carlos I then took the opportunity for a first test drive in the 612 hp Maybach together with Dr Zetsche. His majesty has kindly accepted to test this automobile and to share his thoughts and experiences with Maybach over the next few months. DaimlerChrysler Chairman Dr Dieter Zetsche: "We are very proud to be delivering a Maybach Saloon to the king of Spain, who is an acknowledged automobile expert. In this way His Majesty Juan Carlos I is allowing the Maybach brand to continue a tradition which dates back to the 1920s and 30s, when it supplied its products to numerous royal dynasties. Ever since then, the name of Maybach has stood for the crafting of absolute top-class motor cars." The royal Maybach Saloon has a light beige leather interior with brown burr walnut trim. This unique example from the Maybach Manufaktur in Sindelfingen has a special individualising feature: sterling silver ornaments created by the London silversmith Patrick Mavros adorn the shift lever for the five-speed automatic transmission as well as the covers of the front console and the ashtrays in the fond.